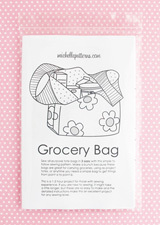 Grocery Bag pattern is available at michellepatterns.com, etsy, & Craftsy. Oh hey, look, it's a giant Grocery Bag! This is my best selling pattern and for a few good reasons--the bags are endlessly useful, they are super quick to make and only take about an hour to make once you've made one or two, and they are a great stash buster. If you've made these bags, you know they aren't complicated. They can easily be resized and with a few basic considerations you can make them for almost any size square or rectangular cut of fabric. I wanted the bag to be bigger than the large size in the pattern. These were the measurements that worked with my fabric pieces. This pattern is written for quilting cotton, which is pretty sturdy fabric, but it's not going to hold up to packing around a ton of weight. I doubt it would rip, but it would wear out quickly. You can of course make these bags from all sorts of other fabrics, but the pattern is designed to provide a practical purpose and a good use for all those pretty, pretty prints many of us love to collect. 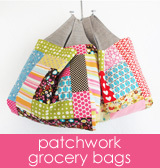 All three sizes can be made with less than one yard of fabric, and even though the instructions aren't written specifically for 1/2 yard cuts of fabric, these bags are an amazing 1/2 yard stash buster! I can't say for certain, but think 1/2 cuts are the most popular size for people to buy and stash away for quilting. With 1/2 yard you have enough to use either in a quilt or to make binding. Plus it's enough fabric to satisfy the wanting part of why we buy fabric, affordable, and not an unreasonable amount to store. Now you might be wondering why I didn't write the instructions for three 1/2 cuts and the answer is it's easier for most people to think in terms of two fabrics. I make lots of patchwork and mix together many different prints, but still notice the increasing difficulty picking three prints that "go together". So the pattern is written for two fabrics only to keep things simple. Essentially this bag can be made from any square or rectangular cut of fabric. The only things to keep in mind are the size of the fold determines how deep the bag will be from front to back, and the handles need to be long enough to be able to come together in your hands. If you want to make some other sizes, but don't want to think too much about it, one simple change is to add depth by increasing the height of the fabric pieces. Then the folds and handle length and placement can remain the same as the instructions. If you add width, this is where the handle changes come into play. For this bag in the photos, I added 3" to the width and 1" to the cut on fold end of the handle. I also move the handles in towards the center slightly. These were just guestimates based on the fact that width was added. There aren't any hard and fast rules. If you only add an inch or two to the width, moving the handles further from the side seams might be all that needs to be done. Other than that, feel free to experiment! I can't see how you really can make any mistakes and even if turns out not quite right, the finished bag can be put to use for storing something (these are fantastic storage bags!). This bag is going to be a good size for light weight groceries like paper products and packaged goods. It's going to be really heavy for things like juice, milk, canned goods. I personally would find it too heavy for anything but very light things, but if you are up for it, and plan to use it to haul somewhat heavy loads, you'll need to use heavier fabric than quilting cotton. 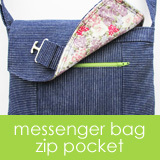 A 7 - 10 ounce utility fabric like denim or canvas is a better choice for a bag this size. The bag here is 7 ounce canvas with quilting cotton lining and it is still light weight (10 ounces finished), but durable. Another idea for this larger bag is to use it for laundry bag. This bag is what I'd consider a "large" load of laundry for a basic washing machine. It will be great for a travel laundry bag, or for anyone who goes to the laundromat to do their laundry. The bags are easy to carry, the laundry can be sorted into separate bags so each bag can just be emptied into a machine, and the bag can be tossed in the wash too from time to time. The Extra Large size ends up measuring about 14.25" h x 15.5" w x 5.75" d (36cm x 40cm x 15cm).